Hi all, got this all ready to book. Just wanted to sense check one thing. I have a 43m domestic connection on the way back in LAX. Is this likely to cause any problems? If I do miss it, my next flight out of JFK isn't until 17:40 the next day so don't think it's the end of the world - if it was the last flight out would AA have a duty of care to give me a hotel overnight in LAX or is that just an EU thing? Excited to be doing my first TP run, and will get me gold in my first year of being totally obsessed by all of this stuff. I've flown ex-PHX with a connection in LAX. Advised to allow a good buffer as the flights are not always on time and with the full addition of T5, you have to traverse two terminals. I wonder if I could pick some knowledge on this. I am currently sat on 790 Tier Points. I am off to SFO on Sunday in W Return. This will leave me on (if I calculate it right) 970 Points. Now, is there any Tier Point runs available, July or First half of August which will get me over the line for Gold? My Tier point year ends 8th August, but can extend for two weeks if needed. I fly out of LHR also. Did a few SFO-LAX-PHX-LGB returns when they use to net 360 TP for ~£350 and then flew the AMS-LGW-JER run. Today, SFO-LAX-PHX-LAS return came up less than LGB at 240 TP for ~£432. If I wanted to do the OTP-PHX run, with the return to OTP some 6-7 months later, does the fare class allow that ? (I have dual citizenship). Yes and no. The flights have to be taken within the specified windows. You can do the outbound in one window and the inbound in the next. Alternatively it will allow you to mix the fare with another higher priced fare but obviously this will be more expensive overall. Windows are until end of August, over Christmas, and then approximately Easter. Might also be around Thanks Giving as well, but you’ll need to check. Should I be worried about the connection time at LAX on the outbound? Apparently the American Eagle flights leave from a different terminal so that could be challenging. I think if AA are guaranteed to rebook me on some service I don't mind the risk, but if it's deemed my fault and then the whole TP run goes in the bin, that would hurt! If that's all fine, then I think this itinerary might on the whole be better. It works out slightly cheaper and gets the A350 AY flight in there. Looks good, but you may want to try and get the earlier flight to OTP in the return, unless you have plans for 10 hours after arriving from HEL. Positioning to OTP and then to LA at the end, so in total (LHR) - OTP - LHR - JFK - LAX - PHX - (LAX) - PHX - LAX - JFK - LHR - OTP - (LHR). All in business bar the positioning flights, and got some lovely seats upstairs on the LHR-JFK flights. Cannot wait! Just a reminder for those booking OTP/PHX fares, there is a collated list of those doing runs in the PHX do thread. Feel free to add your own run should you wish. You might find an opportunity to meet up with fellow FTers on your flights or in the lounges. There is also the airport meet up thread as well. I'm there probably once a month with work, speak a bit of Hungarian and am also happy to help. Happy to help, could also be my first DO. onobond and Scallywag72 like this. Thanks, your experience would be valuable. It turned out to be many of you, with lots of BUD knowledge, responding to my humble request. The future BUD DO will merit it's own thread, will look at that during the weekend, presently on mobile. Frequent flyer 101 and squawk like this. Looks like an 880TP-er (without positioning)? Excellent! Thanks for the suggestion, any recommendation where to split it on the east coast, I am guessing JFK but that may be painful with their immigration and customs? There isn't a question about posting in time - as an extreme case, the points for my last Gold renewal (yes, on RJ) finally arrived two days after my soft-landed Silver pack (year end 08/12, card expired 31/01, points posted 02/02), but it took all of thirty seconds on the phone to have them applied to the proper year (via the two-week extension) and get my status renewed. It's the date of the flight that counts, not the date that the points arrive in your account. Think 840? Have been told the PHX-LAX legs only earn 40 even though in first..
​​​​​I tweaked the routing some more and ended up with a great itinerary which maximises sleeping on the plane (so reduced hotel costs), includes long daytime layovers in LAX and JFK, my whole day in HEL, and I took your advice and got the earlier LHR to OTP flight. Got 64K on a 747 in there too. Can't wait! Thanks a lot for the help everyone. 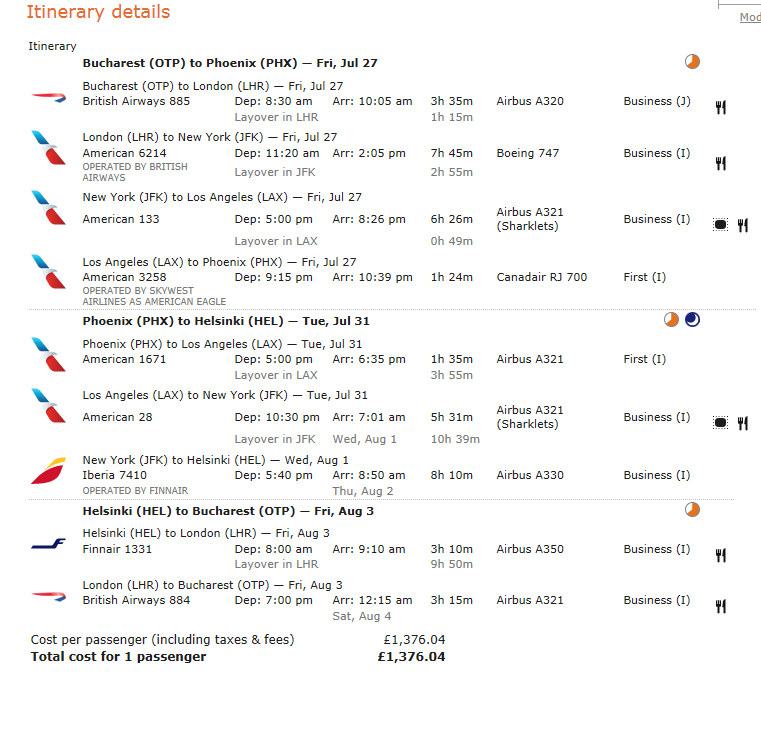 PHL-LAX will get you 140 TP (anything PHX or further West actually will get you 140). LAX to Manhattan beach is a super easy Uber ride. Fun little spot that's not too hectic to kill some layover hours if you don't go downtown. The OP PHX-LAX rather than PHL-LAX? The former is 40.
for a comprehensive list of >2000 mile doemstic AA routes have a look at the reference posts at the start of this thread. Thanks for clarifying, yes PHX - LAX rather than PHL. So I've just returned from a trip to Japan where I made extensive use of JAL's "Japan Explorer Pass". Each segment is a domestic flight, priced from 5,400 JPY (£36.94) to 10,800 JPY (£73.88) depending on route. The great thing about the pass is that each sector can be upgraded to J at the airport (subject to availability) for an additional 1,000 JPY (£6.84). (F class upgrades are also available on some routes, but this is not good value from a TP run perspective -- J class is the sweet spot). I was able to obtain a J class upgrade on every sector where the plane had a J class cabin (four out of five), earning 40 TPs each. I earned 20 TPs for the sector where there was no J class on board and had to stick with Y. If you were to be strategic about this, I reckon there could be decent earning potential. E.g. suppose you strategically choose lightly-loaded flights between Tohoku and elsewhere on planes with a J class cabin. By default, you'll earn 20 TPs for £36.94 (£1.84/TP), with a decent likelihood of earning 40 TPs for £43.78 (£1.09/TP). Obviously you would need to factor in a trip to Japan in the first place though -- but if you're planning a trip to Japan anyway it could be a nice little earner. It's also, in any case, a very cost effective way to travel around Japan. timol, krabbenkopf, MadnessOfCrowds and 2 others like this. Is it possible to upgrade to F for some of the OTP-PHX legs (where it exists). Choosing F on the Matrix returns "no flights" probably because there are no F flights on some sectors. How would i go about this? Should i split the MultiCity into the legs that can be in F and use "bc=" to slect F? or is there a better / easier way to do this? Also, can UuA those sectors as an alternative?